Walk up to any American and ask what century we are in and ask which year our current century began and ask the same about the millennium. Then ask what AD stands for. Most likely, you will get erroneous responses. Keep reading if you are curious about the correct answers. We cover three topics: the mundane topic of Calendar Systems; the ponderous topic of The Nature of Time; and the critical topic of Finding Patterns in Nature. Ancient people notice patterns in the sky probably even before the Agricultural Revolution. Ancient people notice that seasons change. Predicting seasonal change progresses from a delightful pastime to a matter of survival. People also notice how a Crescent Moon progresses to a Half Moon to a Full Moon then back to a Crescent Moon in a cycle of roughly thirty days. It would be so nice and tidy if an exact number of lunar cycles (months) would correspond to one cycle of seasons (a year) but alas! Nature is random. Knowing when to plant and when to harvest is critical for the people of the Agricultural Revolution, so finding patterns in Nature is critical for the survival of our species. People have invented three major types of calendar systems over the millennia: Lunar, Lunisolar and Solar. A Lunar Calendar generally takes only lunar cycles (months) into account, dispensing with intercalation. 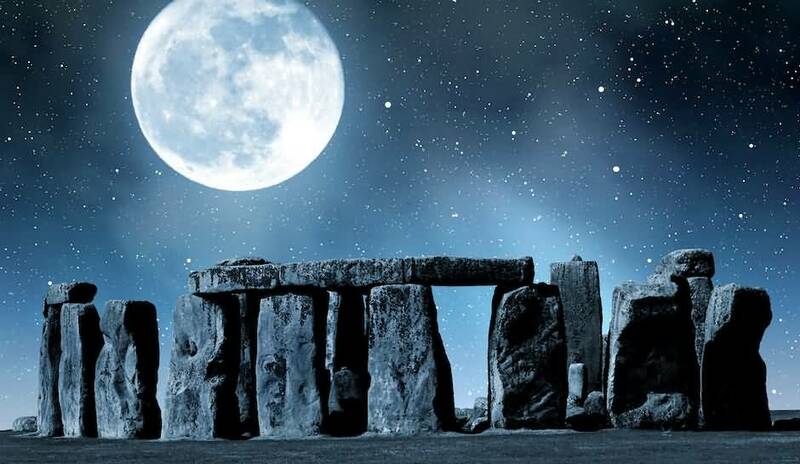 Synodic months are 29 or 30 days in length, making a lunar year exactly 12 lunar cycles long. Your birthday may be in springtime when you are born, but as you grow older, your birthday gradually shifts into other seasons since a strictly lunar calendar is about 11 days shorter than a solar year. A Lunisolar Calendar takes lunar cycles into account as well as annual seasons. This is how you can have a calendar (on Earth) that is nice and tidy! Sun, Earth and Moon return to the same alignment every 19 years. There are 235 actual lunar cycles in a 19-year period. Intercalation seems a little messy but inserting extra months is the only way to make a lunisolar calendar work. We insert a thirteenth month seven times in a 19-year cycle colored green in the chart above. A Solar Calendar generally takes only the four seasons into account; the 12 months do NOT correspond to actual lunar cycles, but do indeed approximate the length of an actual lunar cycle. Months on a Solar Calendar are a little longer than a real month. Hey! You gotta make up for those lost 11 days somehow! Common Era or Current Era (CE) is a year-numbering system for the Julian and Gregorian calendars that refers to the years since the start of this era. The preceding era is referred to as Before the Common or Current Era (BCE). The Current Era notation system can be used as a secular alternative to the Dionysian Era system, which distinguishes eras as AD (Anno Domini) and BC (Before Christ). The two notation systems are numerically equivalent; thus 2017 CE corresponds to AD 2017 and 400 BCE corresponds to 400 BC. The ratio of usage in books has changed dramatically between the years 1800 and 2008, particularly since 1980, with the CE-related variants increasing in usage. The year-numbering system for the Gregorian calendar is the most widespread civil calendar system used in the world today. For decades, it has been the global standard, recognized by international institutions such as the United Nations and the Universal Postal Union. Time is not a thing we can put under a microscope and analyze. Time is more of an inner idea than an external thing. Finding patterns in Nature is a strategy that many forms of Life exploit in a quest to predict and control Life-threatening events, so perhaps the substance of Time is actually the electrochemical interactions between the neurons of the brain. All processes are irreversible. For example, it is impossible to travel back in time – according to the seventh assumption of science (Irreversibility) of the Ten Assumptions of Science written by Stephen J Puetz and Glenn Borchardt PhD in their book Universal Cycle Theory, Neomechanics of the Hierarchically Infinite Universe. That assumption probably disappoints many science fiction fans. But there is another way to address the illusory nature of Time. What if Time is not even real? People are pretty good at surviving, but less talented at unraveling the mysteries of the Universe due to our limited range of thought, so we are ill-equipped to even ponder such things. People do not understand how substance even exists. We only have words for things we understand. We have no word that describes how matter can exist. It seems impossible for there to be Nothing, then Something, because Something cannot simply spring forth from Nothing. A reasonable conclusion might be that substance always existed; matter has no beginning. If all stars, galaxies, planets et cetera are moving about and colliding eternally with no beginning, then Time is not real. Former United Nations Secretary-General Kofi Annan argues in 1999 that the Christian calendar no longer belongs exclusively to Christians. People of all faiths have taken to using it simply as a matter of convenience. There is so much interaction between people of different faiths and cultures – different civilizations, if you like – that some shared way of reckoning time is a necessity. And so the Christian Era has become the Common Era. Whether Time is real or not is not really very relevant in a context of the survival of our species, which is in grave jeopardy. But finding patterns in Nature is a strategy that we exploit in our quest to predict and control Life-threatening events, so all people everywhere on Earth taking full advantage of a common system of measurement is ideal; anything less weakens our ability to coordinate. It is essential that we kill the inch. We must eradicate non-metric measures (having corresponding SI units) so we can fully benefit from the International System of units. A jumble of archaic, incompatible units of measure makes our species weak. The constant need to convert between systems makes us dumber and slow on the draw. One universal, International System makes our species strong and better equips us to combat Life-threatening events. Just as finding patterns in Nature is so critical to our ancient ancestors during our Agricultural Revolution, so too it is critical now in our Modern Era. We must all get on the same page and use the International System that is based on the circumference of Earth and the mass of Water, NOT based on the length of the foot of some long-dead king. One cubic decimeter is equal to one liter is equal to one kilogram of Water. Easy!